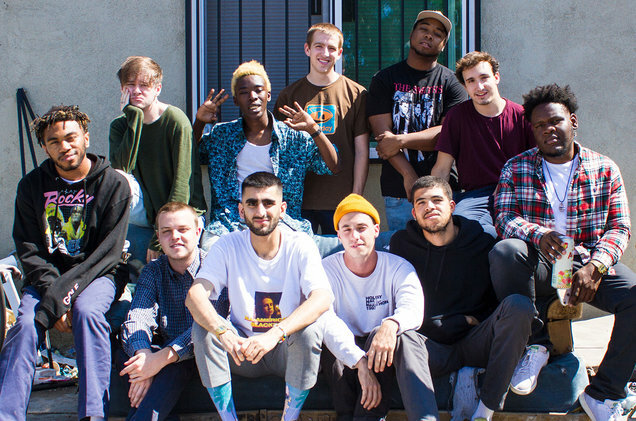 In late May 2018, Ameer Van was kicked out of BROCKHAMPTON. After a year of unprecedented success they ran into a roadblock. Ameer was out and they’d have to make some major changed to their upcoming project. I was sure they’d suffer some kind of slump, but after a great album in the form of Iridescence and the show I just saw, their misfortunes must have only been fuel to the fire. Opening up softly with “WEIGHT” to bring everyone in and get them in the mood then dropping the UK Jungle-esque drumbreak sent the crowd into frenzy. The crowd was thick with people, from what I could tell mostly angsty high schoolers, I was able to nudge my way through the crowd to get a great spot during the ensuing mosh pit that was the forward crowd. The energy thrown off by the boy band was palpable and I was sweating buckets jumping every which way. Having six people up on the stage lets anyone not on the mic amp the crowd up, Don McLennon was particularly great at this never being afraid of getting to the front of the stage and screaming in someone’s face. Being a boy band they all have their own personality, but up on stage those personalities can get lost in the performance. To make up for this, during the brief intermission in their performance they aired some interviews in the format of flashing a short question up, “Jay-Z or Cam’ron?” then having the members answer it. It gave each member a chance to showcase who they are in a way that they’d probably be unable to have during their performance. It was also interesting to hear what the crowd would yell out in response to these questions. However, the point of the concert definitely wasn’t to get everyone in their feelings or being personal. Focusing more on getting the crowd moving, they really only played one of their more “singer-songwriter” songs in “SAN MARCOS”. They noticeably got a bit sloppy with the lyrics at the end of verses; I imagine this was just because they’d run out of breath, while flying across the stage keeping the show hype. They shared a special moment with the crowd when they performed “SAN MARCOS” though. They lied on an inclined platform looking up and sang the song while the video board switched between stars and aerial footage of them lying down. It looked like something out of a Coming of Age film, it felt deeply personal and had the whole crowd singing along. They ended the show with an encore that encapsulated the energy felt in the show with “BOOGIE”. I’ve never been hit with so many teenage elbows and been so content with it in my life. All in all, phenomenal show my only real problem is they didn’t play more of their more personal and emotional songs, but no one goes to a concert to be sad.